Hasselblad has unveiled its Lunar compact system camera (CSC) at Photokina 2012, which currently exists in around 30 different versions. As yet the company doesn't know exactly which ones will make it to market as the final production version. What we do know, however, is that the camera has a 24.3MP APS-C format sensor, 25 AF points and is able to capture both stills and video. Images can also be shot at up to 10fps, with sensitivity settings running from ISO 100-16000. Images may be composed on the ultra-bright 3-inch high definition LCD display or in the OLED viewfinder that Hasselblad claims "guarantees superior contrast and ultra fast response". Built from titanium, wood, leather, carbon fibre and precious metals, the Hasselblad Lunar has a high quality look and build. 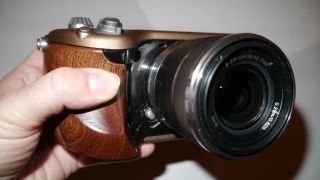 Photographers can even choose from a variety of woods for the finish. The camera will have DSLR-like controls and accept Sony E and Alpha (via adaptor) mount lenses. The Hasselblad Lunar is set for launch in the first quarter of 2013 and will be available in a choice of standard models, plus with a variety of exclusive hand grips and precious materials on special order. It is expected to retail for around €5,000 (around £4,020/$6,525).